The LINE Corporation, which is best known for its LINE messenger, has released a launcher for Android devices. LINE Launcher for Android lets Android users to customize their home screens and keep monotony at bay by customizing various aspects of the user interface. 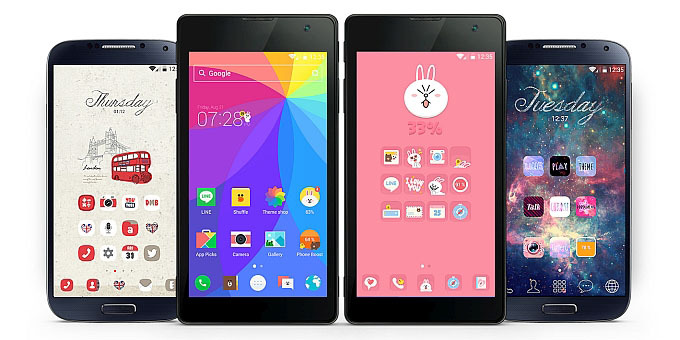 LINE has a similar product called LINE Deco, which is more a collection of homes screens. The LINE Launcher however comes jam packed with all the customization features that you'd expect from a fully-fledged Android launcher, such as widgets, a battery power monitor shaped as a white bunny rabbit, a quick way of freeing up the RAM memory by tapping on a bear icon, and, naturally, a range of 3000 free themes to choose from. On the visual side, the launcher combines traditional LINE characters such as Brown, Cony, and Sally with more general themes like scenery, nature, and animals. We have yet to fully explore all of the content that's available in LINE Launcher, but at a first glance, it looks like there are a bunch of possibilities to explore. One of the highlights of LINE Launcher is what the company calls a "comprehensive search engine" that will simultaneously search through web pages, contacts, and local apps all at once.